“Harry took hold of the bar, felt the metal against the calluses on his hands. His grandfather had said that, that all you need is to be useful. When his grandmother had been giving birth to Harry’s father, she had lost so much blood that the midwife had called the doctor. Grandfather, who had been told there was nothing he could do to help, couldn’t bear to listen to Grandma’s screams, so he walked out, harnessed the horse to the plot and started to plough one of the fields…when the screaming stopped and the doctor came out to tell him that both mother and child were going to survive, he thanks the God he didn’t believe in. That same night the horse collapsed in its stall and died. Now Rakel was lying in bed. Silent. And he had to decide. For those of you who have read my ‘about’ page will know that I am particularly drawn to novels that have a strong sense of place. Authors like Val McDermid, Ian Rankin, Garry Disher, Peter Corris, Anne Holt, Barry Maitland and Cara Black are all at the top of this game. Their books will take you to a city and orient you geographically and, in some cases, politically. Cara Black’s Aimée Leduc series allowed me to navigate Paris like a local when I visited in real life, Peter Corris’ Cliff Hardy gave me all the Sydney landmarks I’ve ever needed, and I’m pretty sure one of Garry Disher’s characters is living in my brother-in-law’s house on the Peninsula in his latest novel... And so in preparation for a trip to Norway in a month or so, I picked up a copy of Jo Nesbø’s eleventh and latest Harry Hole thriller. For those who haven’t read the series, The Thirst will work as a standalone, but I highly recommend setting aside the time to get to know Harry Hole from the start, as it’s a cracking series. As it happens, The Thirst is set in the heart of the Grünerløkka district of Oslo, in which we will be based for several days. By the end of Chapter 1, the body count had begun and Nesbø had walked several key characters past the front door of our ‘charming’ AirBnB apartment. A woman is found murdered after a Tinder date. The marks left on her body point to a particularly unsavoury and vicious killer. Two days later, it happens again. Under pressure from the media to rapidly find the murderer, Oslo Police know there’s only one man for the job. But Harry Hole is finally (dare I say it) happy, and has taken a step back from investigatory work to lecture at the police college. Yet for Harry, ‘…happiness was like moving on thin ice.’ Soon enough, he smells out a connection between these murders and the one case that haunts him. 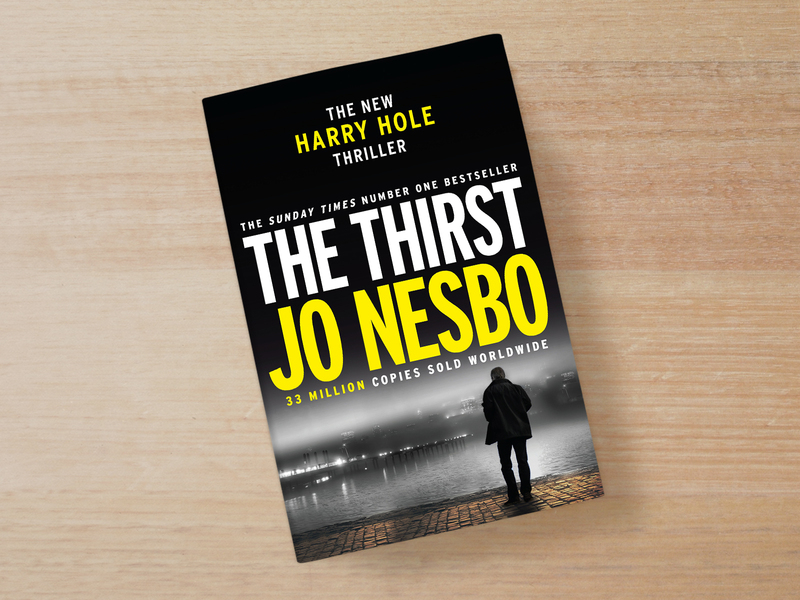 The Thirst is a genuine return to form for Nesbø and Harry Hole. After a few ‘meh’ instalments, Harry - our rebellious anti-hero - is suddenly faced with an unsettling happiness after finally settling down with Rakel, his on-again-off-again-on-again love interest. The two are now married and settled into a quiet life. Harry has kicked the drink and taken to lecturing easily. Harry’s relationship with police work parallels his alcoholism; he may not be on the drink (for now), but the ‘thirst’ remains. This new perspective on an already fascinating character allows Nesbø to take us to some really interesting (and dark) places. The case is gripping, the atmosphere is dark, and the plotting is both complex and tight. After a slow start, Nesbø ramps the tension up to 11 on this one as it progresses to a thrilling crescendo. My general method for assessing a great crime thriller is based on the extent to which I am willing to suspend disbelief when anything that might otherwise be a little too convenient comes along. In this case I was willing to give a free pass to Nesbø when he introduced a Face/Off-style facial transplant justification for an old foe being conveniently unrecognisable. I even managed not to ‘gaffaw’ at the vampirism element. So it’s fair to say that Nesbø has delivered one hell of a thriller. I stayed up to 1.30am to finish this one off and was left with both a great understanding of geography of the Grünerløkka district and the expectation that I’ll likely not sleep a wink while we’re there! The Thirst is a perfect holiday read, solid as it is. It’s great to see the Nesbø / Harry Hole partnership back at its best.